Volkswagen Golf GTD unveiled | What Car? The Volkswagen Golf GTD has been unveiled at the Geneva motor show. Powered by a 181bhp 2.0-litre diesel engine, the Golf GTD sprints from 0-62mph in 7.5 seconds and on to a top speed of 143mph. It produces 280lb ft of torque, which is available between 1750rpm and 3250rpm. Two gearboxes are available: the standard six-speed manual and an optional six-speed semi-automatic DSG unit. The manual car does a claimed average economy of 67mpg with CO2 emissions of 109g/km. Cars fitted with the DSG gearbox have average economy of 60mpg, with emissions of 119g/km for the three-door car and 122g/km for the five-door version. 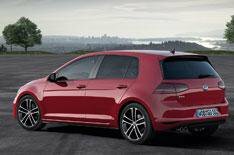 Styling changes over the standard Golf Mk7 include smoked LED tail-lights, twin chrome exhaust tailpipes, roof spoiler and 17-inch alloys. Interior styling upgrades include tartan-covered seats, sports steering wheel, stainless steel pedals and GTD livery on the gearlever. Standard equipment includes climate control, front and rear parking sensors and a winter pack that features heated front seats, sports suspension and progressive steering that changes the feel of the steering to aid low-speed manoeuvrability. The car is on display at the Geneva motor show along with the Golf GTI and Golf Estate. UK prices for the VW Golf GTD haven't confirmed, but expect a starting price of around 25,000 for the three-door and 26,000 for the five-door version.